Creating and organizing works is the core of the platform. This document gives you detailed insight into the idea behind it, the creation of a simple work or on how setting an order for your works. In order to work well for any form of work and for being able to organize works most flexibly, the creation of works functions a bit differntly than i.e. the creation of posts. But don’t fear, you’ll get the idea very quickly. There are two types of works. The normal work and the socalled meta work. A work always belongs to a meta work. A meta work can contain multiple works. In case this text doesn’t answer all of your question, just go and try things direclty. Learning by doing works often pretty well. What needs to be described sometimes is really simple. Following some examples, to prove that the relationship between works and meta works is less abstract than it may seem. An image which solely stands for itself (it isn’t part of a series), would equal a single work contained within a meta work. Both titles would be equal. A series of images equals multiple works contained inside a single meta work. Titles of the contained works can different from work to work. The title of the meta work euals the title of the series as a whole. An installation, consisting of multiple parts would be created the same way as a series (described above). With the differencce that you’d also assign a different medium to each of the contained works (i.e. video or drawing). The medium of the meta work is in that case installation. We start with creating a single work. Below Works click on Add work. You’d be shown a form in which you enter all important data for that word. Following we go into a little more detail for the most important fields. You can control the type of the work with the very first field (type). Depending on what you select here other form fields will become visible and invisible. A video work for example won’t feature any fields for width and height, but runtime. You can select a meta work with the field contained in. It’s up to you if the work you’re about to create should get wrapped in an automatically created meta work or if you select an existing meta work. The field authors allows for specifying one or multiple authors of the work. By default this is just you. But if you’d like to specify multiple names just separate them with comma. Assign a title to the work using the title field. The title of the work is used by default to generate the URL (this is the address shown in the addressbar of your browser) for your work. Is the title of the work i.e. Las Vegas the resulting URL would be /works/las-vegas. You can also activate Make this the meta work's title, too. in case it makes sense for this specific work. That’s especially useful when there is just a single work contained within a meta work. Clicking on Media / Add will show you all available files and also allow you to upload new ones. A detailed description for uploading files can found in the support document Uploading Files. The contents of some fields are available for translation (you must have selected multiple languages in your account settings to enable the translation feature). Those fields appear multiple times each time for one language. If you’d like you can enable automatic translation which will give you live translation as you type. Enable the automatic translation on the right side of the page. When starting to type into i.e. the field Title (english) you’ll see how at the same time the other field contents are translated simultanously. Of course automatic translation isn’t the solution for any content and sometimes leads to strange results. This is why this option is disabled by default. 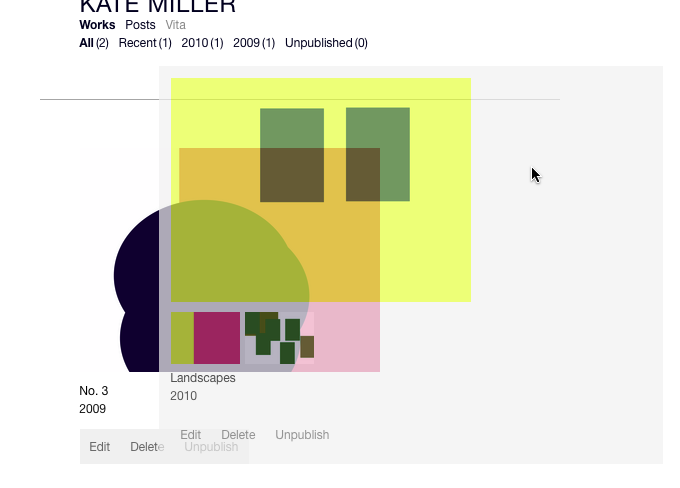 In order to make a meta work including all contained works visible to other visitors you must publish it. After creating a work it is by default in the unpublished state. Most people will argue that it’s unneglectable important in which order works appear on the overview pages as well as inside the meta works. There are two methods to enable you to control that order manually and explictly. Sorting works inside meta works works the same way. Go to the works overview page and click edit on one of the listed meta works. You can sort the contained works as you did before below the Contained works section. In case you’ve got to sort a lot of works, it’s sometimes useful to display the works in a more compact way. This saves you from scrolling miles and miles. Enable this view by checking the Compact view option.